Named for 18th century Indian converts of Mission Espiritu Santo de Zuñiga. A men's college. Founded 1852 by Western Presbytery of Texas. Used buildings of old mission plus funds given by Goliad. Taught Latin, Greek, geography, surveying, bookkeeping, writing, reading, elementary and higher mathematics, English grammar and orthography. 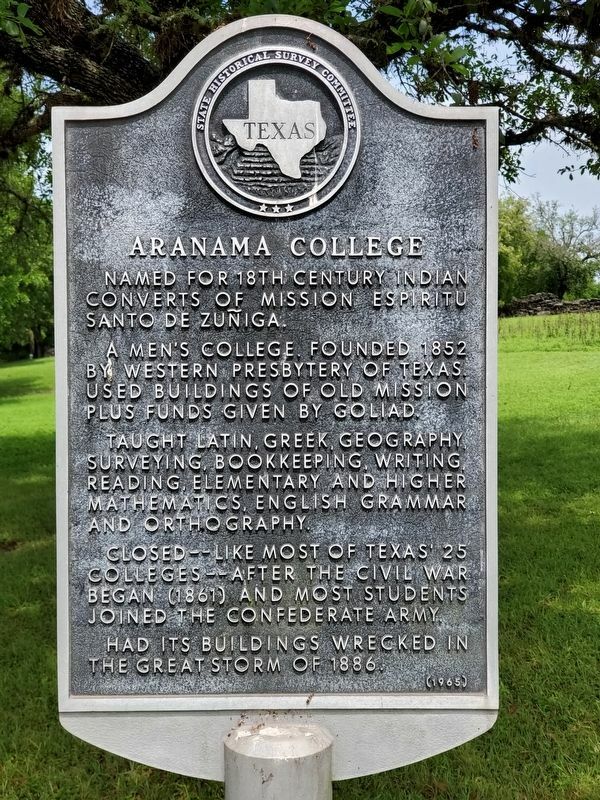 Closed--like most of Texas' 25 colleges--after the Civil War began (1861) and most students joined the Confederate Army. Had its buildings wrecked in the great storm of 1886. Location. 28° 39.393′ N, 97° 23.218′ W. Marker is in Goliad, Texas, in Goliad County. Marker is on Park Road 6, on the right when traveling west. Touch for map. 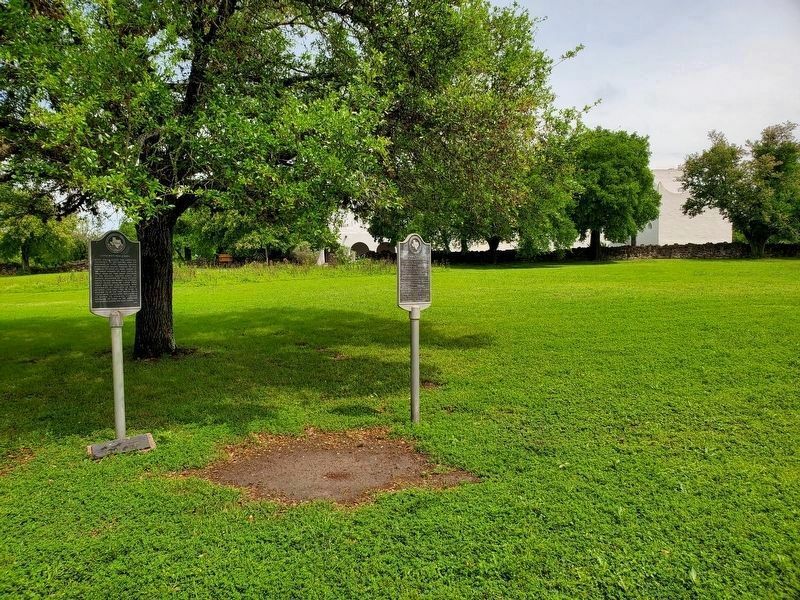 Marker is near the parking area of Goliad State Park & Historic Site. Marker is at or near this postal address: 108 Park Road 6, Goliad TX 77963, United States of America. Touch for directions. (within shouting distance of this marker); Mission Nuestra Senora Del Espiritu Santo De Zuniga (within shouting distance of this marker); Judge James Arthur White and the Civilian Conservation Corps at Goliad State Park (about 800 feet away, measured in a direct line); Goliad Memorial Auditorium (approx. ¼ mile away); Presidio de Nuestra Señora de Loreto de la Bahía (approx. 0.6 miles away); Manuel Becerra (approx. 0.6 miles away); Replica of Texas Independence Flagpole (approx. 0.7 miles away). Touch for a list and map of all markers in Goliad. More. Search the internet for Aranama College. Credits. This page was last revised on April 12, 2019. This page originally submitted on April 11, 2019, by Brian Anderson of Kingwood, Texas. This page has been viewed 92 times since then. Photos: 1, 2. submitted on April 12, 2019, by Brian Anderson of Kingwood, Texas.